Tons of progress has been made on our poustinia project since we last updated you in our spring newsletter. 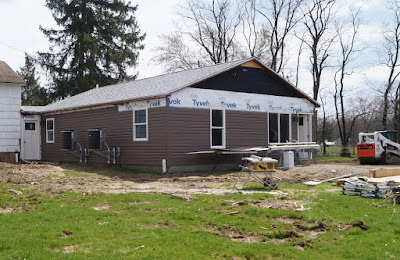 The siding is being finished up, and the driveway and new parking spaces are being leveled and covered with crushed limestone. 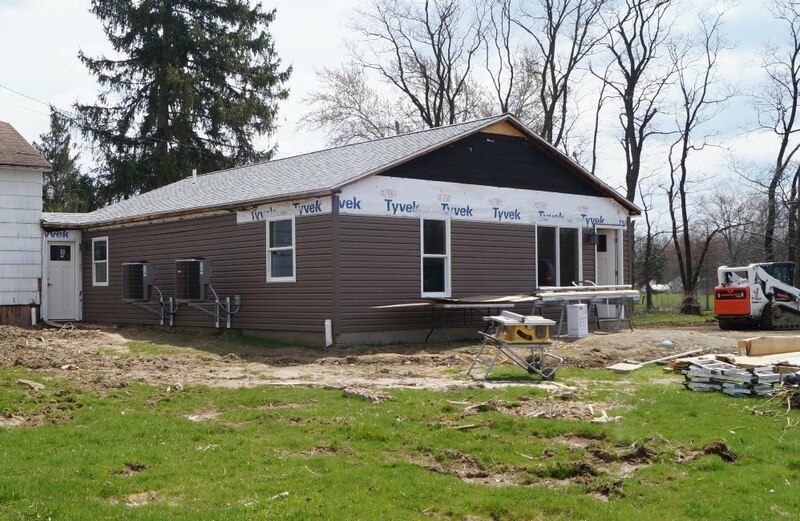 Inside, the plumbing, heating, cooling, electrical system, walls, cabinets, doors and moulding have been installed. Mother has been working on a coat of light stain on the beautiful hardwood paneling in the sitting areas. 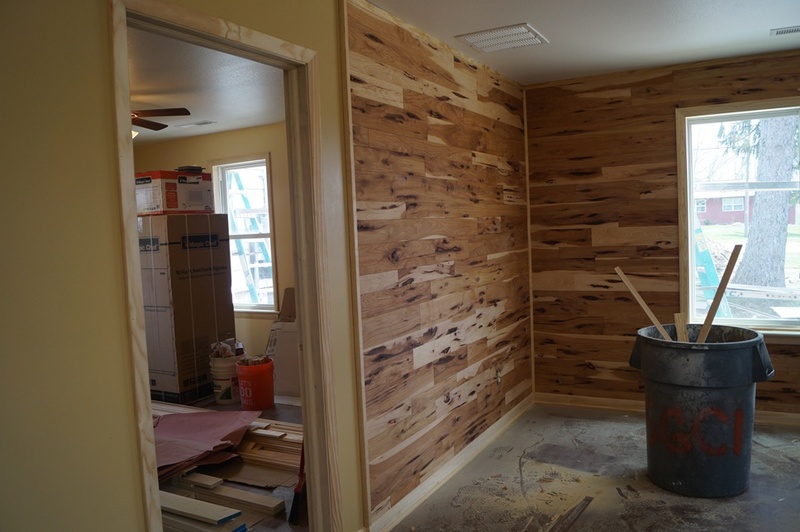 The doors and moulding were donated by Mouldings One and the hardwood paneling was donated by Sheoga Flooring. We are excited to see the finishing touches and to look for the furniture that will be just right for each poustinia! 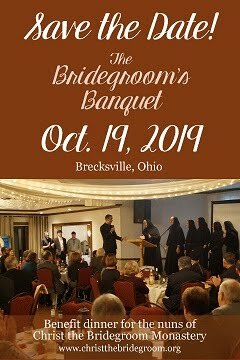 Please contact us if you are interested in donating toward the purchase of new or slightly used furniture (christthebridegroom@gmail.com or 440-834-0290). 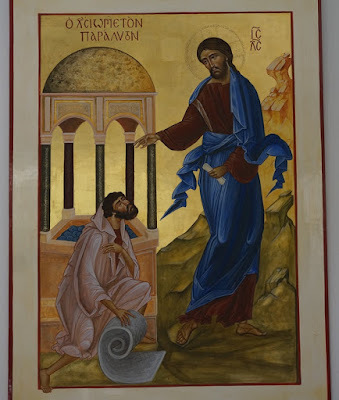 This morning as I listened to the Gospel reading of the Healing of the Paralytic Man, my heart leaped with joy as I remembered that I had been in the Pool of Bethesda last July during our pilgrimage to the Holy Land. 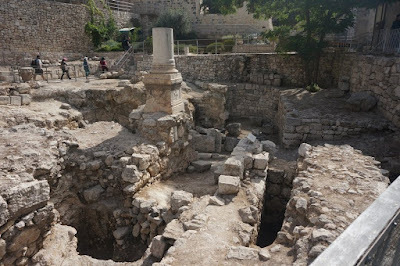 The pool is in Jerusalem, a stone's throw away from the Church of St. Ann, which marks the birth place of the Mother of God. Today, visitors can walk down into the maze of rooms and stairways that make up the ruins of the pool and the Byzantine and Crusader churches that were built upon it. Looking down into some of the lower areas, you can see water. Through Fr. Sebastian, Jesus came into the pool with me, asking the Father for His will to be done in me. 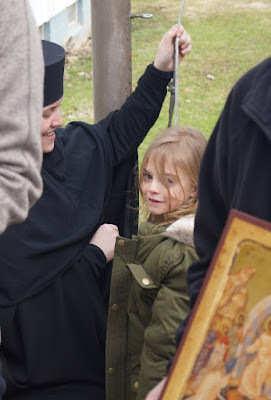 It was not the Father's will at that moment for physical healing, but each time I ask for healing, I trust that He is healing spiritual ills a little at a time--those ills which paralyze me the most. When we get frustrated by our various infirmities, Jesus is asking us, as He asked the paralytic man, "Do you want to be healed?" Let us not turn inward on ourselves, but look quickly to Him and ask for healing! And then let us quickly trust that He is raising us from our beds of sickness, by the power of the grace of baptism and of all of the Holy Mysteries (Sacraments), and in our lives of prayer and love. He is healing us so that we may be able to remain with Him in faith, just as He is always with us in our sickness, calling out to us. 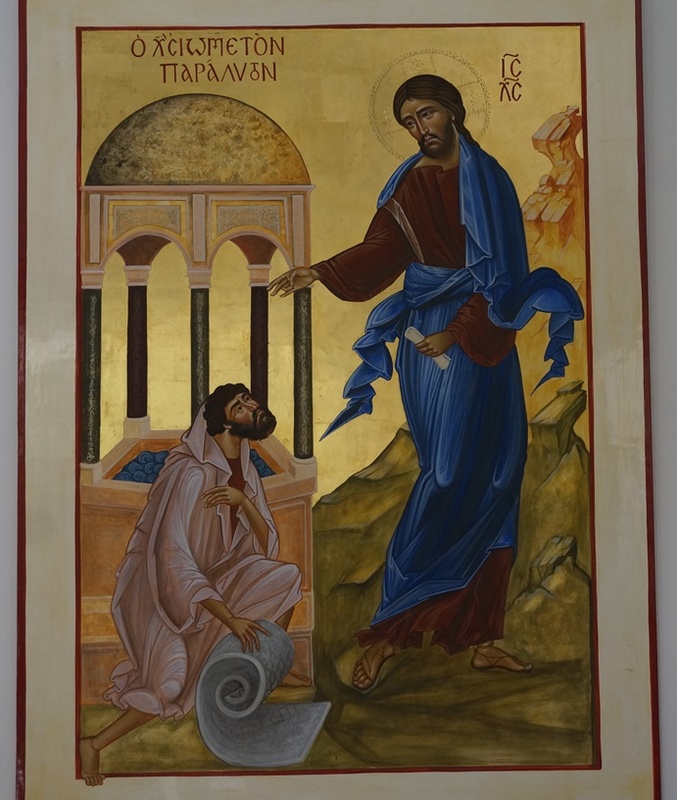 "O Lord, with Your divine authority, as You once raised the paralytic, now raise my soul, paralyzed dreadfully with all kinds of sin and disgraceful deeds, that, being saved, I may cry out to You: Glory to Your power, O merciful Christ" (Kontakion of the Paralytic Man). 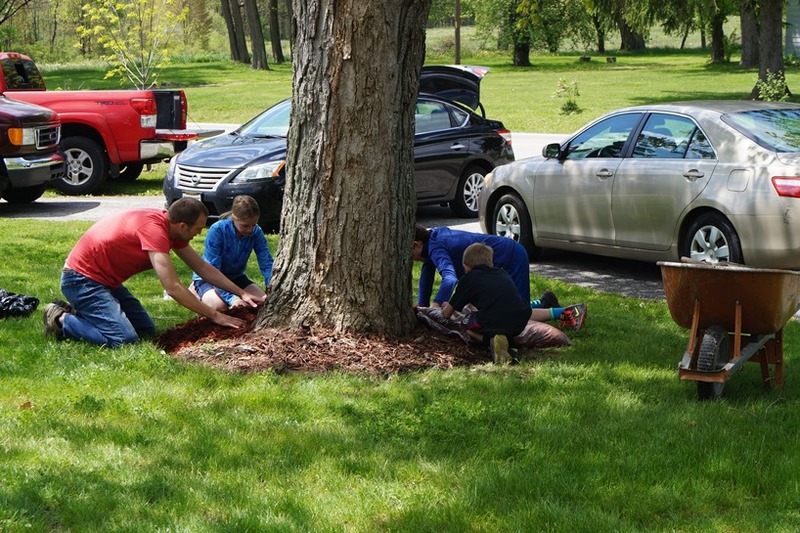 Join us for a day of outdoor and indoor work projects, prayer, food and fun at the monastery and the Shrine of Our Lady of Mariapoch on Saturday, May 26. Volunteers of all ages and abilities are welcome! The day begins at 10 a.m., includes lunch, and closes with vespers at 5 p.m. followed by a cookout. Come at whatever time you are available, and bring a side dish to share if you can. The monastery is located at 17485 Mumford Rd. Burton, Ohio. 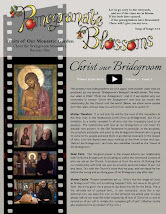 Please RSVP* by Monday, May 21, to 440-834-0290 or christthebridegroom@gmail.com. 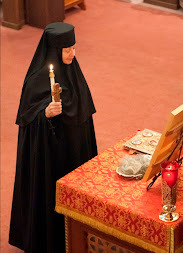 Today on the Sunday of the Myrrh-bearing women I am reflecting back on a grace the Lord worked in my heart a few years ago – a grace which still affects me deeply to this day. I had been sick in bed during Holy Week and feeling frustrated that I was missing all the services and “missing” all my prayer times. 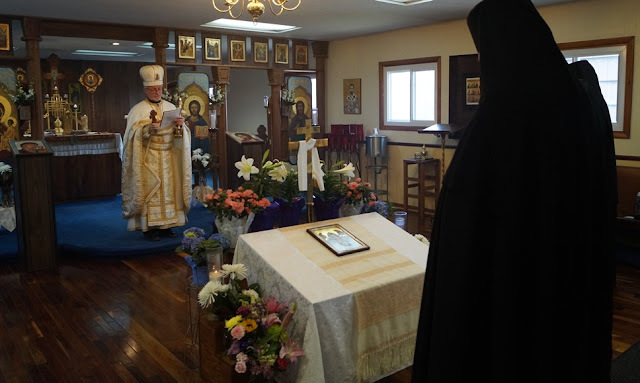 At last on Holy Saturday I was well enough to go, at least, to my icon corner in my room, for some quiet, upright prayer (those of you who are sick, know how cherished these upright moments are). But my hands were unsteady, and as I poured oil into my hanging lamp, I accidentally spilled oil all over my icon corner. Instead of having the prayer time that I so desired, I had to spend the next hour trying to clean up the mess. What a waste, I thought. The next day, after all the Paschal services, my spiritual father unexpectedly stopped by. In an attempt to be funny, I asked him, “I know what Jesus says about the wise virgins who have oil in their lamps and about the unwise virgins who run out, but what about the ones who spill their oil all over their icon corners?” Instead of laughing, he looked at me very seriously and said, “You are the woman who poured her oil over Jesus.” My heart was immediately stirred. Later the Lord would show me that just as the oil poured over Jesus was not a waste, so too our love is poured out but never wasted. I could see now how often I had been afraid to “waste” my love because I thought it would not be received. Or worse yet, I feared giving my love to those who didn’t “deserve” it. But I was seeing more clearly than ever that I was most called to pour my love out over the seemingly “undeserving,” and that my love would never be wasted. I did not need to worry about controlling the outcomes of this pouring out, but to unite it to Him who would use it in any way that He wished. I realized that as I poured oil over the “least of these” my brethren (see Mt 25:40), I was pouring it over the wounds of Jesus. This love was a consolation to His wounded heart. I had felt so frustrated and inconvenienced by the oil spill because I thought it had taken away my prayer time, not realizing that this oil spill was extremely valuable prayer time. As this reflection began to permeate and settle into the pores of my heart, my eyes were opened to deeper levels of understanding. The Myrrh-bearing women planned to anoint part of the dead body of Jesus, but their mission failed. They were sent instead to tell the disciples that Jesus was risen. They were called, in other words, not to anoint part of the dead body of Jesus, but the whole living body of Jesus, the Church. We are, each one of us, called to anoint every member of His body, from the weakest to the strongest. We are called to love. We are called to give what we have received from Him. Indeed He is Risen! We hope you are enjoying a beautiful celebration of Our Lord's Resurrection, or that you will this Sunday, depending on when you celebrate it. "If any man be devout and love God, let him enjoy this fair and radiant triumphal feast. If any man be a wise servant, let him rejoicing enter into the joy of his Lord. If any have labored long in fasting, let him now receive his recompense. If any have wrought from the first hour, let him today receive his just reward. If any have come at the third hour, let him with thankfulness keep the feast. If any have arrived at the sixth hour, let him have no misgivings; because he shall in nowise be deprived thereof. If any have delayed until the ninth hour, let him draw near, fearing nothing. If any have tarried even until the eleventh hour, let him, also, be not alarmed at his tardiness; for the Lord, who is jealous of his honor, will accept the last even as the first; he gives rest unto him who comes at the eleventh hour, even as unto him who has wrought from the first hour. 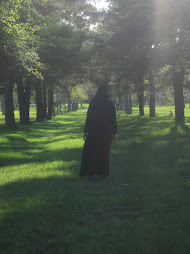 O Death, where is your sting? O Hell, where is your victory? Christ is risen, and you are overthrown. Christ is risen, and the demons are fallen. Christ is risen, and the angels rejoice. Christ is risen, and life reigns. Christ is risen, and not one dead remains in the grave. For Christ, being risen from the dead, is become the first fruits of those who have fallen asleep. To Him be glory and dominion unto ages of ages. Amen."